When checked the tax rate can be changed when entering an invoice. Otherwise, the default tax rate is always used. (On supplier invoices the actual tax amount can be directly edited if this option is checked. This allows perfect matching of tax amounts with amounts charged by a supplier). Normally the confirm dates on invoices are read only and are filled in automatically by mSupply when the invoice is confirmed. If you need to enter your own dates, check this option and enter a number in the 'Maximum days before current date' box (you might see a default number of 30 days in here which you can change). Note that you will not be able to modify the dates on finalised invoices. The entry date is still maintained by mSupply. You can only edit the confirm date. If this box is checked, each time you finalise customer or supplier invoices, a tab-delimited text file of the finalised invoices will be created. This allows you to import the data into an accounting application. If this box is checked, deleting invoice lines will result in all invoice line numbers being updated so there is no gap in the numbering. You can choose to round prices to a given number of decimal places. By default prices will be rounded to 2 decimal places. Some people use mSupply for inventory control of all sorts of general goods. Hiding these fields will speed up entering information if you do not use those fields. When receiving an item where there is a margin set for both the supplier and the item, if this option is checked the item margin will be used. If unchecked, the supplier margin is used. Check this box if you want mSupply to record the outstanding amount to be paid on each supplier invoice. If this system is not activated, supplier invoices will display a zero amount outstanding. (If you use a separate accounting system, and us mSupply's export facilities, there is no need to use the inbuilt payment system). An appropriate figure can be entered . If this option is checked you can't receive goods that haven't had their sell price set. If checked, this option allows the user to track donated stock from source (supplier Purchase Order) to store (available for distribution in mSupply). 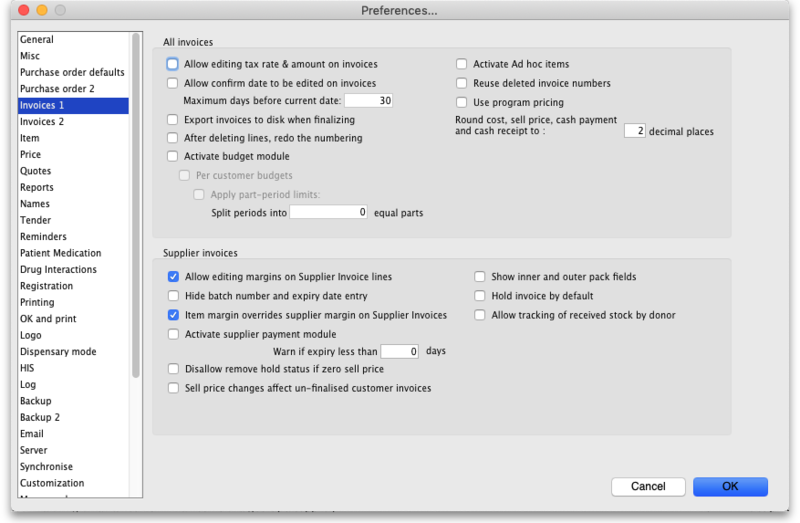 These options apply to customer invoices only. Check this item if you want to record backorders for customers for supply at a later date (For suppliers, backorders are recorded in the ordering system as partially supplied orders). Note that if you use a backorder system it will affect the way “placeholder” lines are handled. A placeholder line is a line entered on a customer invoice which does not have any stock associated with it. Placeholder lines can have an item name, a quantity, and a pack size, but the batch number is set to “none”. When you confirm an invoice, if you are using a backorder system, placeholder lines will be transferred to make backorders. If you are not using a backorder system, placeholder lines will be deleted if the option below is turned on. Check this item if you want stock to be automatically issued to a customer with a backorder when it becomes available. If this box is checked, then a transport details button will be shown on customer invoices, allowing editing of transport details (arrival dates, etc) and box numbers. If you leave this box unchecked, all lines on an invoice will have to be actual stock. If you run a backorder system you must check this box. If this box is checked, the window for issuing stock will be enlarged to show the area to enter abbreviations and customer directions or notes under store mode. These notes print on invoices after each invoice line. If this box is checked, the window for issuing stock will be enlarged to show the area to enter abbreviations and customer directions or notes under dispensary mode. These notes print on invoices after each invoice line. Check this box if you want mSupply to record the outstanding amount to be paid on each customer invoice. If this system is not activated, supplier invoices will display a zero amount outstanding. (If you use a separate accounting system, and use mSupply's export facilities, there is no need to use the inbuilt payment system). If you are making use of the item category facility, checking this box will allow you to see the category of the item you are issuing as it is being issued. Handy for helping invoices to not get forgotten! Checking this box allows you to choose a contact from your list of contacts when entering transport details. Checking this box allows you to create an invoice using a Bill of Materials. The function inserts placeholder lines from BOM into the invoice - see here for details. There are 4 customer transaction fields available for customised entries; their use is optional, and should you wish to use them, they have to be activated here, where the Show custom transaction fieldscheckboxes should be checked. You will note that they are grouped in pairs, 1 & 2 and 3 & 4, and this is also the window which allows you to define names for the fields; for example, you might wish to identify the person preparing the invoice and so give field 1 the name “Prepared by”; similarly the person authorising the invoice could be entered in field 2, which would be named “Authorised by”. Entering a number in this box causes mSupply to alert the user when any item selected is due to expire before this number of days has passed. If this option is checked, mSupply will not allow issue (customer invoices, prescriptions) of goods with an expiry date less than the number of days specified here. Goods with no expiry date will not be affected. Note that once this preference is checked, there is no way for the user to override it- the rule is enforced until the preference is turned off. Enter zero in the field to disallow entry of goods that have expired. Note that inventory adjustments and supplier credits can still be issued to remove goods from stock or return goods to a supplier. When this check box is checked, any item that is assigned to a department may only be supplied to customers who are members of groups linked to that item's department. See the section in the Item Menu chapter on the Manage item access… for more information on how to set up item departments, customer groups, and how to link groups to departments. Warning: Checking this item may mean that some items can not be issued. Make sure you have set up the item access system properly before proceeding. When checked, placeholder lines are deleted when the invoice is confimed. When this box is checked, the message typed in this field will be printed in the batch column for placeholder lines. For example, you might enter “backorder” to show these lines will be backordered. If you check the box and leave this field blank , the batch field will be empty. If this option is checked, when entering customer invoices the user will be required to select one of the available transaction categories. Transaction categories are set up using the Special > Show transaction categories menu item. If no transaction categories for customer invoices have been set up, this option will have no effect. Invoices will be put on `hold' if this box is checked. If checked, the Order written date field on a customer invoice (on the Transport details tab) must be filled in - if it isn't the user will be shown an alert message and asked to fill it in. If checked, the Order received date field on a customer invoice (on the Transport details tab) must be filled in - if it isn't the user will be shown an alert message and asked to fill it in. Checking this box allows a customer to enter the quantity of stock they have and mSupply will file it as part of their stock history and calculate how much needs to be sent to them to replenish their stock.